It seems that upcoming David Letterman replacement and original Star Wars fan Stephen Colbert is set to interview George Lucas, the critically acclaimed auteur behind indie stunner THX 1138. Vanity Fair reports that the two will sit down during this year‘s Tribeca Film Festival to discuss filmmaking, Indiana Jones, and how happy everyone is that Lucas has recused himself from any further Star Wars involvement. During the talk—which Lucas will then presumably attempt to license into plush toys, lunch boxes, and a poorly received holiday TV special—Colbert and the director-producer are expected to discuss the upcoming Star Wars movies, despite Lucas’ noted lack of participation in them. As Lucas has noted, Disney wasn’t too excited about his ideas for what should happen next. “The [ideas] that I sold to Disney—they came to the decision that they didn’t really want to do those. So they made up their own,” he said, perhaps not realizing that Disney is behaving roughly akin to every other Star Wars fan on Earth, were they put in a similar position. 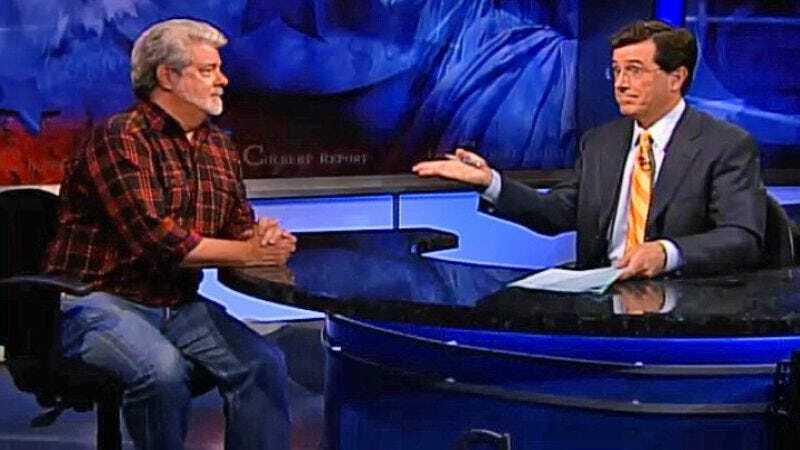 This will also mark the first time Colbert has publicly interviewed Lucas outside of his Colbert Report persona, meaning the talk show host will finally be free to weep openly while explaining to the director what it’s like to watch The Phantom Menace.